The pants to shirt transmutation has been ongoing for the past two weeks. After I pinned the heck out of it, I tried it on and discovered that it looks better on my dress form. Even though my dress form is adjustable, it somehow is still more curvy than me. I’m on the right track, but not quite there. The first few attempts at structuring the shirt looked pretty, but didn’t work well with my body. I got lost in all the draping fabric. The main problem was the under-arm area. There was just too much room in the former pant leg and I got lost in the new “sleeves.” I tried gathering, pulling, and pinning. Another issue I had with this first design is its layering difficulty. I get cold easily and often wear 2-3 layers to work. 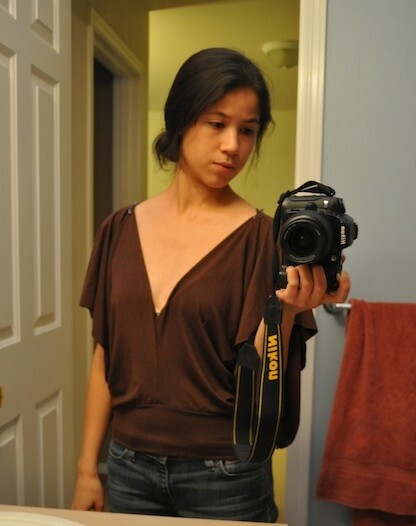 I like shirts that can easily fit inside a cute cardigan. It might be a pretty shirt, but if it doesn’t fit with my clothing personality, I probably won’t wear it as much as I would like. Finally I realized that the area on the side of the body (the former side seam of the pant) needed to be pulled straight up, over the shoulder. 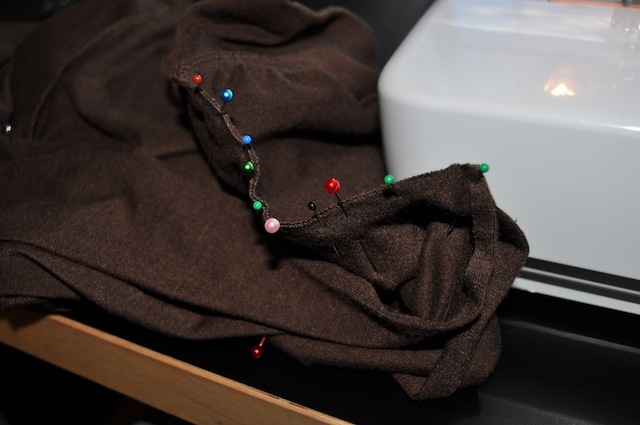 I ended up re-sewing the shoulder and seam to make the sleeves narrower. 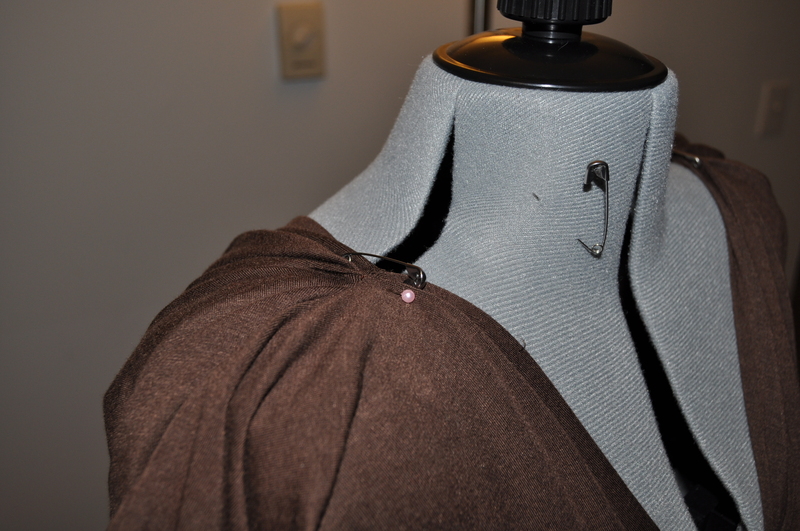 The top of the shoulders then because the main location of gathering and the source of all further drapes. 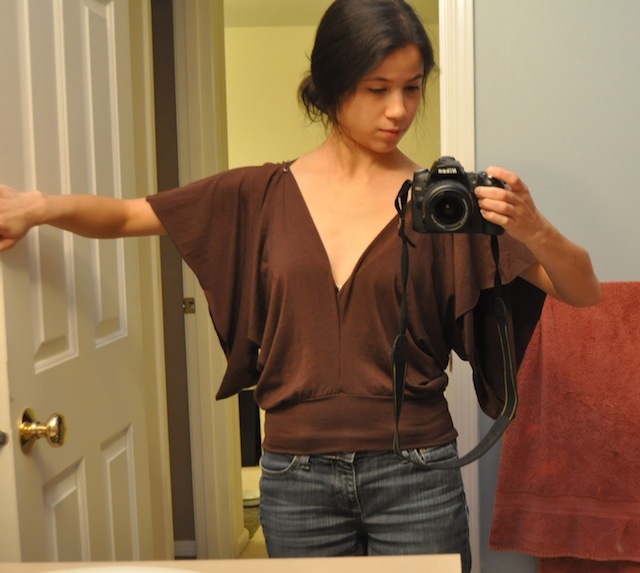 Then I tried it on…and discovered I had made the armholes too high and narrow. It was not comfortable. But I had already cut and stitched. 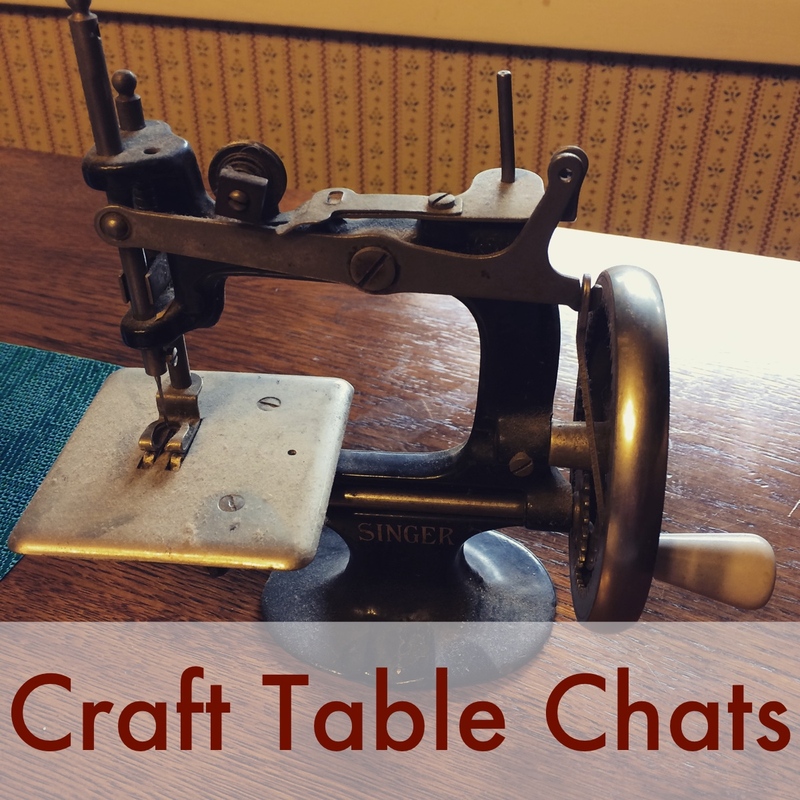 I tried various other ways of pinning, draping, and folding to reduce the excess. I never got around to stitching any of these permutations because I was never in love with any of them. Some looked like nice shirts, but not shirts that I would love enough to buy off the rack. It looks like a shirt. 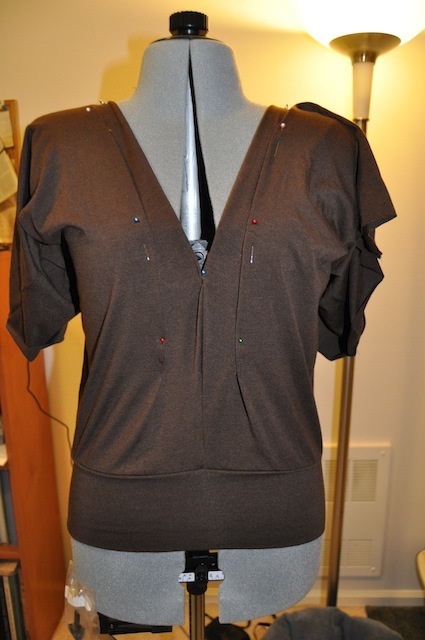 I have been trying to make this shirt with minimal cutting, and I think that distracted me. I allowed the pants to dictate too much of the shirt’s design and forgot to design a shirt that would make me look amazing. 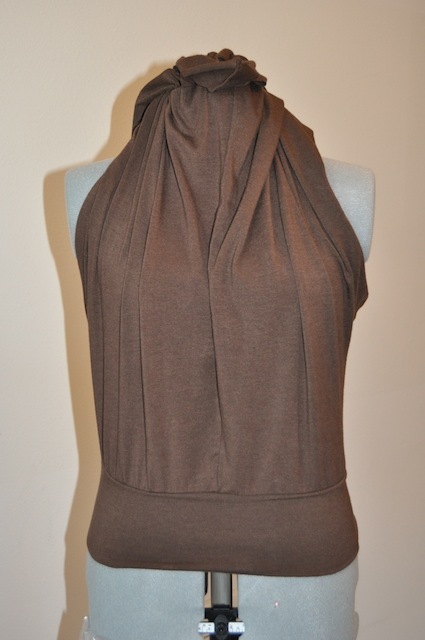 After doing a bit of scouting (this is what I call walking around, discretely staring at other womens’ clothes for inspiration), I thought to rotate the garment 90 degrees. 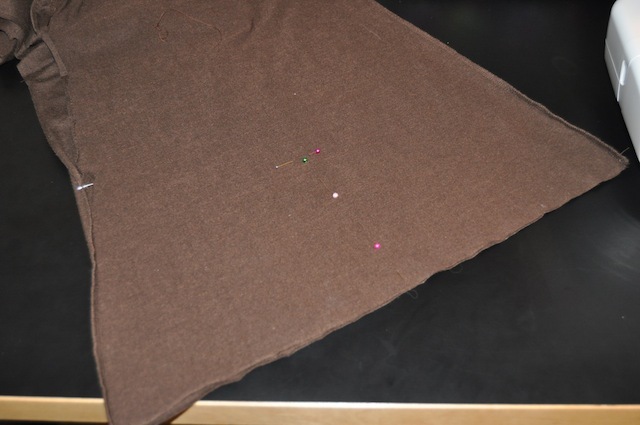 The former crotch seams (which had been the front and back center seams) became the side seams. It still requires some pinning and cutting, but I already like the look of this variation better. I foresee some awesome summer nights in this shirt. Should I leave it as a sleeveless shirt, or should I give it raglan sleeves?